Abrasion Resistance - The ability of a fiber or fabric to withstand surface wear and rubbing. Absorbency - The ability of a fabric to take in moisture. Absorbency is a very important property, which affects many other characteristics such as skin comfort, static build-up, shrinkage, stain removal, water repellency, and wrinkle recovery. Acetate - A manufactured fiber formed by a compound of cellulose, refined from cotton linters and/or wood pulp, and acetic acid that has been extruded through a spinneret and then hardened. Angora - The hair of the Angora goat or the Angora rabbit. The clipped fiber from a living animal is also known as Angora mohair. Scoured mohair appears smooth and white. It varies in fineness and is highly resilient, very strong and has high luster. Its value is determined by its luster and not its softness. The Angora rabbit is indigenous to Asia Minor and Turkey. It is often blended and mixed with wool to lower the price of the finished. Angora rabbit hair is long, very fine, light weight, extremely warm and fluffy. It has a tendency to shed and mat with time. According to the U.S. Federal Trade Commission, any apparel containing Angora rabbit hair must be labeled as "Angora rabbit hair" on the garment. Aramid fibers – A class of heat-resistant and strong synthetic fibers. They are used in aerospace and military applications, for ballistic rated body armor fabric, and as an asbestos substitute. The name is a shortened form of "aromatic polyamide". They are fibers in which the chain molecules are highly oriented along the fiber axis, so the strength of the chemical bond can be exploited. Aromatic polyamides were first introduced in commercial applications in the early 1960s, with a meta-aramid fiber produced by DuPont® under the tradename Nomex. This fiber, which handles similarly to normal textile apparel fibers, is characterized by its excellent resistance to heat, as it neither melts nor ignites in normal levels of oxygen. It is used extensively in the production of protective apparel, air filtration, thermal and electrical insulation as well as a substitute for asbestos. Meta-aramid is also produced in the Netherlands and Japan by Teijin under the tradename Teijinconex, in China by Yantai under the tradename New Star and a variant of meta-aramid in France by Kermel under the tradename Kermel. Based on earlier research by Monsanto and Bayer, a fiber - para-aramid - with much higher tenacity and elastic modulus was also developed in the 1960s-1970s by DuPont® and Akzo Nobel, both profiting from their knowledge of rayon, polyester and nylon processing. Much work was done by Stephanie Kwolek in 1961 while working at DuPont, and that company was the first to introduce a para-aramid called Kevlar in 1973. A similar fiber called Twaron with roughly the same chemical structure was introduced by Akzo in 1978. Due to earlier patents on the production process, Akzo and DuPont® had a patent war in the 1980s. Twaron is currently owned by the Teijin company (see Production). Para-aramids are used in many high-tech applications, such as aerospace and military applications, for "bullet-proof" body armor fabric. The Federal Trade Commission definition for aramid fiber is: A manufactured fiber in which the fiber-forming substance is a long-chain synthetic polyamide in which at least 85% of the amide linkages, (-CO-NH-) are attached directly to two aromatic rings. Autoclave - An autoclave is a device or process to sterilize equipment, supplies or garments by subjecting them to high pressure saturated steam at 121 °C or more, typically for 15-20 minutes depending on the size of the load and the contents. Typically, a garment that has been subjected to the autoclave process temporarily feels stiff and abrasive to the touch. Blend - A term applied to a yarn or a fabric that is made up of more than one fiber. In blended yarns, two or more different types of staple fibers are twisted or spun together to form the yarn. Examples of a typical blended yarn or fabric is polyester/cotton or “polycotton”. Broadcloth – A dense woolen cloth. Modern broadcloth can be composed of cotton, silk, or polyester, but traditionally broadcloth was made solely of wool. The dense weave lends sturdiness to the material. It was made in several parts of England at the end of the medieval period. The raw material was short staple wool, carded and spun into yarn and then woven on a broad loom to produce cloth 1.75 yards wide it was then fulled, usually in a fulling mill. When fulled, the fibers of the cloth would felt together, resulting in a smooth surface. Cabretta - Thin, fine leather made from the skin of hair sheep. It is used in gloves needing superior tactility and dexterity. Canvas - A strong, durable, closely woven cotton fabric. Cargo - Characterized by sporting a large pocket usually with a flap and a pleat. Carpenter pants / shorts - Five-pocket pants characterized by a "hammer holder," a stretch of material connecting the outside seam to the back pocket. Chamude - A soft and flexible synthetic leather with a suede surface texture which breaths like genuine leather. It is machine washable. Similar to Clarino™. Chino – A cotton fabric of a left-handed twill. Combined two-ply warp and filling. Has a sheen that remains. Fabric was purchased in China (thus the name) by the U.S. Army for uniforms. Originally used for army cloth in England many years before and dyed olive-drab. Fabric is mercerized and sanforized. Washes and wears extremely well with a minimum of care. Now you know the history of the popular chino slacks. Clarino™ – A soft and flexible synthetic leather which breathes like genuine leather. Commonly found in police duty-gear and gloves. Clarino™ is also known as "hi-gloss" in some references. Composite Fabric – In performance garments, an engineered fabric made from two or more components. One component is often a strong fiber such as fiberglass, Kevlar®, or carbon fiber that gives the material its tensile strength, while another component (often called a matrix) is often a resin, such as polyester or epoxy that binds the fibers together. Compression Fabric – In performance garments, high tenacity stretch fabric which, when in a close fitting garment, provides muscles with a firm compression fit that lessons vibrations, reduces fatigue, and keeps muscles energized. The fabric is usually made in a knit construction, using a series of gradient fibers with an open knit inner surface to create a moisture transfer environment. Compression Stretch - The name given to the expansive stretch that is created by the spandex fibers used in the development of a compression fabric for performance garments. Convertible Collar - A rolled collar that can be worn open or closed. Sewn directly to the neckline. Cotton - Cool, soft, comfortable, the principal clothing fiber of the world. Its production is one of the major factors in world prosperity and economic stability. Cotton "breathes". Since cotton wrinkles, polyester was added to give it wash and wear properties for a busy world. In recent times, the consumer determined that polyester, although easier to care for, took away the cool from cotton and also added a "pilling" effect to cotton/polyester blends. Consumers now often request "100% Cotton". Permanent finishes also added to the all cotton fabric gave a wash and wear property to cotton. cotton. The cotton fiber is from the cotton plant’s seed pod. The fiber is hollow in the center and, under a microscope looks like a twisted ribbon. "Absorbent" cotton will retain 24-27 times its own weight in water and is stronger when wet than dry. This fiber absorbs and releases perspiration quickly, thus allowing the fabric to "breathe". Cotton can stand high temperatures and takes dyes easily. Chlorine bleach can be used to restore white garments to a clear white but this bleach may yellow chemically finished cottons or remove color in dyed cottons. Boiling and sterilizing temperatures can also be used on cotton without disintegration. Cotton can also be ironed at relatively high temperatures, stands up to abrasion and wears well. Mercerized cotton is treated to permanently straighten the cotton fibers, which then becomes a smooth, rod-like fiber that is uniform in appearance with a high luster. Cotton is often blended with other fibers such as polyester, linen, wool, to "blend" the best properties of each fiber. Crew Neck - A round neck with ribbed banding that fits close to the base of the neck. Dacron - Trademark for a polyester fiber. Dacron is a condensation polymer obtained from ethylene glycol and terephthalic acid. Its properties include high tensile strength, high resistance to stretching, both wet and dry, and good resistance to degradation by chemical bleaches and to abrasion. The continuous filament yarn is used in curtains, dress fabrics, high-pressure fire hoses, men's shirts, and thread. The staple fiber is ideal for mixing with wool in men's and women's suits, as well as in dress fabrics, knitted wear, and washable woven sportswear. Denier - A system of measuring the weight of a continuous filament fiber. In the United States, this measurement is used to number all manufactured fibers "both filament and staple", and silk, but excludes glass fiber - The lower the number, the finer the fiber; the higher the number, the heavier the fiber. Numerically, a denier is the equivalent to the weight in grams of 9,000 meters of continuous filament fiber. Denim - A rugged cotton twill textile, in which the weft passes under two or more warp fibers. This produces the familiar diagonal ribbing identifiable on the reverse of the fabric, which distinguishes denim from cotton duck. Denim has been in American usage since the late eighteenth century. The word comes from the name of a sturdy fabric called serge, originally made in Nimes, France, by the Andre family. Originally called serge de Nimes, the name was soon shortened to denim. Denim was traditionally colored blue with indigo dye to make blue "jeans," though "jean" then denoted a different, lighter cotton textile; the contemporary use of jean comes from the French word for Genoa, Italy, where the first denim trousers were made. A similarly woven traditional American cotton textile is the diagonal warp-striped hickory cloth that was once associated with railroadmen's overalls, in which blue or black contrasting with un-dyed white threads form the woven pattern. Hickory cloth was characterized as being as rugged as hickory wood - not to mention the fact that it was deemed to be worn mainly by "hicks" - although neither may be the origin of that term [from a nickname for "Richard". Records of a group of New Yorkers headed for the California gold fields in 1849 show that they took along four "hickory shirts" apiece. Hickory cloth would later furnish the material for some "fatigue" pantaloons and shirts in the American Civil War. The word dungarees, to identify heavy cotton pants such as overalls can be traced to a thick cotton country-made cloth, Dongari Kapar, which was sold in the quarter contiguous to the Dongari Killa, the fort of what was then known as Bombay. The word entered English with just this meaning in 1696. Dongri Fort was rebuilt in 1769 as Fort George, Bombay, where the first cotton mill was established in 1854. Dyed in indigo, the traditional cloth was used by Portuguese sailors and cut wide so that the legs could be swiftly rolled up when necessary. Thus, dungarees have a separate history. Double-Breasted - Having one-half of the front lapped over the other. Usually has a double row of buttons and a single row of buttonholes. Elasticity - The ability to increase in length under tension and then return to the original length when released. Elastique - An Elastique cloth is a "double" weave. Notice Elastique fabric by the traditional diagonal line within the weave pattern. The double layers of the Elastique cloth traces its history back to the Indian War period of our Nation, when Cavalry Soldiers needed a more durable cloth to counter the saddle wear. For Soldiers today, the Elastique provides a more durable cloth if the uniform is worn more than a few times each year. Elastique also allows for the usage of Teflon® to treat the yarn fibers, making the Elastique fabric water repellant and less prone to soiling. Embossing - A pressure process using engraved rollers and heat application to produce raised or relief patterns on the surface of the fabric. Embroidered - An embellishment of a fabric or garment in which colored threads are sewn into the fabric to create a design. Embroidery may be done either by hand or machine. Felt – Made from wool, reprocessed wool, reused wool, or scrap fiber, and can be mixed with other such as fibers, cotton, or rayon. Felt fabric is not woven but felted. It is a very compact fabric in various weights and thicknesses and has grain so can be cut any way. Felt needs no hemming or finishing because it does not fray. It has many industrial uses such as piano hammers and in the printing industry. Fiberfill - Specially engineered manufactured fibers, which are used as filler material in pillows, mattresses, mattress pads, sleeping bags, comforters, quilts, and outerwear. Filament - A manufactured fiber of indefinite length "continuous", extruded from the spinneret during the fiber production process. Filling - In a woven fabric, the yarns that run cross the fabric from selvage to selvage, and which run perpendicular to the warp or lengthwise yarns - Also referred to as the weft. Flame Resistant - A term used to describe a fabric that burns very slowly, or has the ability to self-extinguish upon the removal of an external flame. Flat-Front Pants - Straight pants, often seamless and without pockets. Fleece - A soft, bulky, deep-piled knitted or woven fabric of wool or cotton in a plain, twill, pile or knitted weave. Fleece has a deep, soft nap or pile obtained by heavily napping with wire brushes or with a pile weave. This provides air space giving good insulating properties without too much weight. The inter-lacing space is covered by the nap. The nap wears out in time, but good quality cloth gives good wear. Range from cheap to expensive clothes. Material is often cumbersome and bulky, therefore it may be difficult to manipulate. Form-Fitting "Slim Fit" - Straight from waist to ankle except for a slight curve around the hip. Forte of a garment - The strong point of the garment. Frey - Threads which come out from the fabric during handling. Gabardine - A tough, tightly woven fabric used to make suits, overcoats, trousers and other garments. The fiber used to make the fabric is traditionally wool, spun into a worsted yarn, but may also be cotton, synthetic or mixed. The fabric is smooth on one side and has a diagonally ribbed surface on the other. Gabardine is a form of twill weave. Gusset - Pertaining to fabrics and sewing: Gusset is a triangular or square piece of fabric inserted into a seam to add breadth or reduce stress. Gussets were used at the shoulders, underarms, and hems of traditional shirts and chemises made of rectangular lengths of linen to shape the garments to the body. Gussets are used in manufacturing of modern tights or pantyhose to add breadth at the crotch seam; these gussets are often made of breathable fabrics for hygiene. HIPORA® - A waterproof film with polyurethane coating. Numerous micro pores are placed all over the polyurethane coating which shut out water from the outside, yet allow the moisture or warm steam from the body to exit. Glove liners made with HIPORA® are waterproof, windproof and breathable all at the same time and will keep hands dry and comfortable. Jersey - The consistent inter-looping of wool, worsted, silk, cotton, rayon, and synthetics yarns in the jersey stitch to produce a fabric with a smooth, flat face, and a more textured, but uniform back. Jersey fabrics may be produced on either circular or flat weft knitting machines. Right side has lengthwise ribs "wales" and wrong side has crosswise ribs "courses". Jersey is very elastic with good draping qualities and has special crease-resistant qualities due to its construction. It is knitted plain or has many elaborate tweed designs and fancy motifs as well as printed designs. It can look very much like a woven fabric. Jersey wears very well and, if washable, it washes very well. Jersey was first made on the Island on Jersey off the English coast and used for fisherman's clothing. Stretch as you sew. Jersey Fabric - The consistent inter-looping of yarns in the jersey stitch to produces a fabric with a smooth, flat face, and a more textured, but uniform back. Jersey fabrics may be produced on either circular or flat weft knitting machines. KEVLAR® by DuPont™ - Kevlar® is the registered trademark for a light, strong para-aramid synthetic fiber, related to other aramids such as Nomex® and Technora. Developed at DuPont® in 1965 by Stephanie Kwolek, it was first commercially used in the early 1970s as a replacement for steel in racing tires. Typically it is spun into ropes or fabric sheets that can be used as such or as an ingredient in composite material components. Currently, Kevlar® has many applications, ranging from bicycle tires and racing sails to body armor because of its high strength-to-weight ratio—famously: "...5 times stronger than steel on an equal weight basis..."
Knit - Fabrics made from only one set of yarns, all running in the same direction. Some knits have their yarns running along the length of the fabric, while others have their yarns running across the width of the fabric. Knit fabrics are held together by looping the yarns around each other. Knitting creates ridges in the resulting fabric. Wales are the ridges that run lengthwise in the fabric; courses run crosswise. Knit Fabrics - Fabrics made from only one set of yarns, all running in the same direction. Some knits have their yarns running along the length of the fabric, while others have their yarns running across the width of the fabric. Knit fabrics are held together by looping the yarns around each other. Knitting creates ridges in the resulting fabric. Wales are the ridges that run lengthwise in the fabric; courses run crosswise. Knitted - Formed by interlacing yarn or thread in a series of connected loops with needles. Lapels "Jacket lapels" - The decorative revers on the face of formal jackets, most commonly found on men's clothing. They are formed by turning down the collar and turning back the top part of the jacket's closure, as in this image. Collars arose from simple necklines to support neckwear then were turned over into lapels starting in the late 18th century. There are three basic forms of lapels: notched, peaked and shawl. Notched, the most common, is often seen on business suits. Peaked and shawl are the more formal, traditionally seen on dinner jackets and tailcoats. Often, a lapel pin or boutonniere is worn on the lapel of formal jackets. Leather - A hide or skin that has been preserved by a chemical process called tanning. Leather is the most ancient form of clothing known to man and only certain types are adaptable for gloves. The following are types of leather and their characteristics: Kangaroo – Pound-for-pound the strongest and most durable leather available. Goat Skin – Known for high abrasion resistance and a slightly rougher texture. Cow Hide – Very consistent in quality and weight; flexibility in finishes. Sheep Skin – A very thin leather known for its superior softness and pliability. Deer Skin – Recognized for its long term wearability and non-slip grip. Linen - A fabric made from linen fibers obtained from inside the woody stem of the flax plant. Linen fibers are much stronger and more lustrous than cotton. Linen fabrics are very cool and absorbent, but wrinkle very easily, unless blended with manufactured fibers. Lycra™ - DuPont’s® trademark for its spandex fiber. Any time you see this fiber listed on a label, expect comfort, movement, and shape retention that won't wash away. Lycra increases the life of a garment, making it more sustainable. It adds stretch and versatility and contributes to a wider array of fashion fabrications. Madras – A lightweight plain weave cotton fabric with a striped, plaid, or checked pattern. A true madras will bleed when washed. This type of fabric is usually imported from India. End-uses are men's and women's shirts and dresses. Generally cotton although can also be made from rayon and silk. Plain weave or can be a dobby or jacquard weave used for designs. Originated in Madras, now called "Chenia", India and it is known to be a very old cloth. Much of it has a plain colored background with stripes, plaid, checks, or designs on it. Has a high thread count. Madras is made with combed or carded yarns depending on the quality. Some is mercerized to make it lustrous and durable. Often the dyes are not fast and with each washing, color changes take place. Mandarin Collar - A short, stand-up collar, adopted from the close-fitting Asian collar. Mercerization – A finishing process of treating a cotton yarn or fabric, in which the fabric or yarn is immersed in a caustic soda solution "sodium hydroxide" and later neutralized in acid. The process causes a permanent swelling of the fiber, resulting in an increased luster on the surface of the fabric, an increased affinity for dyes, and increased strength. Merino - A type of wool that originates from pure-bred Merino sheep. The best Merino wool comes from Italy. Nano-fiber - Nano refers to 1 billionth of a meter, or 1 x 10-8 centimeter. 150,000 strands of a nano-fiber can fit across a human hair. Nano-technology - Complex technology that involves nano-size "excessively microscopic" materials and combines science such as biology, chemistry and physics and engineering. Napped Fabrics - Cotton fabrics which have been dry finished by raising fibers on the surface to produce a fuzzy fur-like feel and appearance created when fiber ends extend from the basic fabric structure to the fabric surface. The fabric can be napped on either one or both sides. Cotton flannel is an example. Natural Fibers - Materials that grow in nature such as cotton, flax, hemp, alpaca, wool and silk. The processing of natural fibers into organic clothing is done with as few chemicals and harmful impact on the environment as possible. Nomex™ "styled NOMEX™" - A registered trademark for flame resistant meta-aramid material developed in the early 1960s by DuPont® and first marketed in 1967. It can be considered an aromatic nylon, the meta variant of the para-aramid Kevlar. It is sold in both fiber and sheet forms and is used as a fabric wherever resistance from heat and flame is required. Nomex sheet is actually a calendered paper and made in a similar fashion. Nomex Type 410 paper is the original and one of the larger grade types made, mostly for electrical insulation purposes. The Spruance plant, in Richmond, VA, is the sole North American paper production site. The paper is used in electrical laminates such as circuit boards and transformer cores as well as fireproof honeycomb structures where it is saturated with a phenolic resin. Honeycomb structures such as these, as well as mylar-Nomex laminates are used extensively in aircraft construction. Both the firefighting and vehicle racing industries use Nomex to create clothing and equipment that can stand up to intense heat. All aramids are heat and flame resistant but Kevlar, having a para orientation, can be molecularly aligned and gives high strength. Meta aramid cannot align during filament formation and has poor strength. Nomex fiber is made in the USA and in Spain. A Nomex hood is a common piece of firefighting equipment. It is placed on the head on top of a firefighter's face mask. The hood protects the portions of the head not covered by the helmet and face mask from the intense heat of the fire. Race car drivers have to wear a multi-layer Nomex driving suit & flame-resistant gloves, long underwear, balaclava, socks and shoes to protect them in the event that a fire engulfs their car. The FIA provides specifications for the FIA Standard 8856-2000 flame-resistant clothing to be used in racing. Military pilots and aircrew wear flight suits made of over 92 percent Nomex to protect them from the possibility of cockpit fires and other mishaps. Recently, troops riding in ground vehicles have also begun wearing nomex. The remaining material is typically Kevlar thread used to hold the fabric together at the seams. In the U.S. space program, Nomex has been used for the Thermal Micrometeoroid Garment on the Extravehicular Mobility Unit (in conjunction with Kevlar and Gore-Tex) and ACES pressure suit, both for fire and extreme environment (water immersion to near vacuum) protection, and as thermal blankets on the payload bay doors, fuselage, and upper wing surfaces of the Space Shuttle Orbiter. It has also been used for the airbags for the Mars Pathfinder and MER rovers, the Galileo atmospheric probe, the Cassini-Huygens Titan probe, and will be incorporated into the new Crew Exploration Vehicle that will replace the Shuttle after 2010. The DuPont scientist responsible for discoveries leading to the creation of Nomex, Dr. Wilfred Sweeny, earned a DuPont Lavoisier Medal partly for this work in 2002. Nylon - Became a household word in 1940 when it was knitted into hosiery. In 1942 it was called into service for the armed forces use in parachutes, flak vests, combat uniforms, tires and many other vital military uses. Until the war was over nylon was not available to the public. Nylon became one of the most versatile fibers of the man-made fabrics. In addition to hosiery, nylon is used in tricot, netting for bridal veils, and in carpeting. Nylon is stronger yet weighs less than any other commonly used fiber. It is elastic and resilient and responsive to heat setting. Nylon fibers are smooth, non-absorbent and dry quickly. Dirt doesn’t cling to this smooth fiber nor is it weakened by chemicals and perspiration. Extensive washing and drying in an automatic dryer can eventually cause piling. Nylon whites should be washed separately to avoid graying. This fabric may yellow so it should be bleached frequently with sodium perborate bleach. Nylon melts at high temperatures. If ironing is necessary, always use a low temperature on the wrong side. Olefin (also known as polyolefin and polypropylene) - A manufactured fiber characterized by its light weight, high strength, and abrasion resistance. Olefin is also good at transporting moisture, creating a wicking action. End-uses include activewear apparel, rope, indoor-outdoor carpets, lawn furniture, and upholstery. Oxford – Cotton, or sometimes rayon in a plain weave. Warp has two fine yarns which travel as one and one heavier softly-spun bulky filling which gives it a basket-weave look. Better qualities of oxford cotton are mercerized. It is a rather heavy fabric that is usually all white but some has a spaced stripe in the warp direction. Oxford launders very well but soils easily. When made with yarn dyed warp and white weft, it is called oxford chambray. The one remaining commercial shirting material made originally by a Scotch mill which bore the names of four Universities - Oxford, Cambridge, Harvard, and Yale. Well known for men's shirts, but is also used for summer jackets, shirts, skirts, dresses, and sportswear. Performance Fabrics - Fabrics made for a variety of end-use applications, which provide functional qualities, such as moisture management, UV protection, anti-microbial, thermo-regulation, and wind-water resistance. Pile Knit - A type of knit construction which utilizes a special yarn or a sliver that is inter-looped into a standard knit base. This construction is used in the formation of imitation fur fabrics, in special liners for cold weather apparel such as jackets and coats, and in some floor coverings. While any basic knit stitch may be used for the base of pile knits, the most common is the jersey stitch. Pique "Pique Knit" - Cotton, rayon, or synthetic fabrics in a lengthwise rib, English crosswise rib or cord weave that creates a stiff, durable ribbed fabric with an embossed pattern produced by a double warp thread. Originally was a crosswise rib but now mostly a lengthwise rib and the same as bedford cord. Ribs are often filled to give a more pronounced wale "cord weave". Comes in medium to heavy weights and is generally made of combed face yarns and carded stuffer yarns. It is durable and launders well, but wrinkles badly unless given a wrinkle-free finish. It also comes in different patterns besides wales. Some of the patterns are birdseye "small diamond", waffle "small squares", and honeycomb "like the design on honeycomb honey". When the fabric begins to wear out it wears at the corded areas first. Placket - The piece of cloth that reinforces a split or opening in a garment. Usually also serves as the closure. Polyester (also known as Terylene) - A category of polymers which contain the ester functional group in their main chain. Although there are many forms of polyesters, the term "polyester" is most commonly used to refer to polyethylene terephthalate "PET". Other forms of polyester include the naturally-occurring cutin of plant cuticles as well as synthetic polyesters such as polycarbonate and polybutyrate. Polyester may be produced in numerous forms. For example, polyester as a thermoplastic may be heated and processed into different forms and shapes, e.g., fibers, sheets and three-dimensional shapes. While combustible at high temperatures, polyester tends to shrink away from flames and self-extinguishes. Industrial polyester fiber have high tenacity and E-modulus, low water absorption and shrinkage properties compared to other industrial fibers as polyamid fibers. Polypropylene (also known as polyolefin and Olefin) - A manufactured fiber characterized by its light weight, high strength, and abrasion resistance. Polypropylene is also good at transporting moisture, creating a wicking action. End-uses include activewear apparel, rope, indoor-outdoor carpets, lawn furniture, and upholstery. Poplin (also called tabinet (or tabbinet) - Is a fabric consisting of a silk warp with a weft of worsted yarn. As the weft is in the form of a stout cord the fabric has a ridged structure, like rep, which gives depth and softness to the lustre of the silky surface. It is made with wool, cotton, silk, rayon, or any mixture of these, though originally made from silk. The ribs run across the fabric from selvage to selvage. Poplins are used for dress purposes, and for rich upholstery work. They are formed by using coarse filling yarns in a plain weave. Shirts made from this material are easy to iron and do not wrinkle easily. In recent years, Poplin has come to be associated with 100% cotton shirts and it is commonly used for high quality garments. Medical Uniforms almost exclusively use Poly-Cotton blended Poplin fabrics. The term is also frequently used while rendering and is most commonly associated with the construction of wallets. The term poplin originates from papeline, a fabric made at Avignon, France in the 1400s. The fabric was so named for the papal residence there. Rayon - A manufactured regenerated cellulosic fiber. Rayon is produced from naturally occurring polymers and therefore it is not a truly synthetic fiber, nor is it a natural fiber. It is known by the names viscose rayon and art silk in the textile industry. RAYON, from cellulose, has many of the qualities of cotton, a natural cellulose fiber. Rayon is strong, extremely absorbent, comes in a variety of qualities and weights, and can be made to resemble natural fabrics. Rayon does not melt but burns at high temperatures. Rayon drapes well, has a soft, silky hand, and has a smooth, napped, or bulky surface. Rayon will wrinkle easily and may stretch when wet and shrink when washed. Technological advancements to the rayon process have produced high wet modulus "HWM" rayons such as lyocell and modal which makes fabric less prone to stretch when damp or wet. Washable rayon will state the care on the fabric label. Like silk, if you pre-wash rayon fabric prior to construction of the garment, you have a washable garment. Rayon Fabrics include: Fibranne is French term for Viscose rayon, and Velvet, although made from silk, is most often produced from the rayon fiber. Ribbed - To form vertical ridges in knitting. Rib Weave - One of the plain weave variations, which is formed by using: Heavy yarns in the warp or filling direction, or a substantially higher number of yarns per inch in one direction than in the other, or several yarns grouped together as one. Rib fabrics are all characterized by having a slight ridge effect in one direction, usually the filling. Such fabrics may have problems with yarn slippage, abrasion resistance, and tear strength. Examples of this construction include broadcloth, poplin, taffeta, faille, shantung, and cord fabric. Rip-stop Nylon - A lightweight, wind resistant, and water resistant plain weave fabric. Large rib yarns stop tears without adding excess weight to active sportswear apparel and outdoor equipment such as sleeping bags and tents. Fabric woven with double thread at regular intervals to create small squares that prevent tears from spreading. Usually made from nylon or polyester and used in packs, sleeping bags, tent sand gear. Sateen - A cotton fabric with a satin-like finish, often found in bed sheets. Sateen is usually made of cotton, or sometimes rayon. Better qualities are mercerized to give a higher sheen. Some are only calendered to produce the sheen but this disappears with washing and is not considered genuine sateen. Sateen may be bleached, dyed, or printed. It is difficult to make good bound buttonholes on it as it has a tendency to slip at the seams. Sateen produces the sheen and softer feel through the use of a different structure in the weaving process. The sateen structure is four over, one under, placing the most threads on the surface, making it extremely soft, though slightly less durable than other weaves. Standard, non-sateen, weaves use a one over, one under structure. Satin also uses this structure, however, instead of using cotton, different materials are used "e.g., silk, polyester, etc". Sateen Weave - A variation of the satin weave, produced by floating fill yarns over warp yarns. Satin - A traditional fabric utilizing a satin weave construction to achieve a lustrous fabric surface. Satin is a traditional fabric for evening and wedding garments. Typical examples of satin weave fabrics include: slipper satin, crepe-back satin, faille satin, bridal satin, moleskin, and royal satin. Traditionally made from silk, satin can also be made from rayon and synthetics. It originated in China. It became known in Italy during the XIIth, and XIIIth Centuries and in England by the XIVth Century. It became a favorite of all court life because of its exquisite qualities and feel. It usually has a lustrous surface and a dull back. The luster is produced by running it between hot cylinders. It is made in many colors, weights, varieties, qualities, and degrees of stiffness. A low grade silk or a cotton filling is often used in cheaper cloths. Scalloped Edge - A border that contains continuous curves finished with bourdon stitching. Scoop Neck - Round Neck - A low, U-shaped or round neckline. Seamless Knitting - A unique process of circular knitting, done on either Santoni or Sangiacomo knitting machines. This circular knitting process essentially produces finished garments with no side seams, which require only minimal sewing to complete the garment. Seamless knitting can transform yarn into complete garments in a fraction of the time it takes for traditional garment manufacturing, by minimizing the traditional labor-intensive steps of sutting and sewing. Seersucker - A woven fabric of cotton, rayon or synthetics which incorporates modification of tension control. In the production of seersucker, some of the warp yarns are held under controlled tension at all times during the weaving, while other warp yarns are in a relaxed state and tend to pucker when the filling yarns are placed. The result produces a puckered stripe effect in the fabric. The term is derived from the Persian "shirushaker", a kind of cloth, literally "milk and sugar". Colored stripes are often used. It has a dull surface and comes in medium to heavy weights. The woven crinkle is produced by alternating slack and tight yarns in the warp for a permanent effect. The crinkle effect can also be produced by pressing or the use of chemicals, which is not likely to be permanent - called plisse. It is durable and will wear for years. It may be laundered without ironing. Can be bleached, yarn dyed, or printed. Some comes in a check effect. Often used in summer suits for men, women, and children, coats, uniforms, trims, nightwear, all kinds of sportswear, dresses, blouses, children's wear of all kinds, curtains, bedspreads, slipcovers. Selvage or Selvedge - The thin compressed edge of a woven fabric which runs parallel to the warp yarns and prevents raveling. It is usually woven, utilizing tougher yarns and a tighter construction than the rest of the fabric. Serge - A type of twill fabric that has diagonal lines or ridges on both sides, made with a two-up, two-down weave. The worsted variety is used in making military uniforms, suits, great and trench coats. Its counterpart, silk serge, is used for linings. French serge is a softer, finer variety. The word is also used for a high quality woolen woven. The name is derived from Old French serge, itself from Latin serica, from Greek "serikos", meaning "silken". The early association of silk serge, Greece, and France is shown by the discovery in Charlemagne's tomb of a piece of silk serge dyed with Byzantine motifs, evidently a gift from the Byzantine Imperial Court in the 8th or 9th century A.D. From early Saxon times, most English wool "staples" was exported. In the early sixteenth century it went mainly to a Royal monopoly at Calais and was woven into cloth in France or the Low Countries. However, with the capture of Calais by the French on 7 January 1558, England began expanding its own weaving industry. This was greatly enhanced by the European Wars of Religion "Eighty Years' War, French Wars of Religion"; in 1567 Calvinist refugees from the Low Countries included many skilled serge weavers, while Huguenot refugees in the early eighteenth century included many silk and linen weavers. Denim is a cotton fabric with a similar weave; its name is believed to be derived from "serge de Nîmes" after Nîmes in France. Serging -An over-casting technique done on the cut edge of a fabric to prevent raveling. Shrinkage - The contraction of a fiber, yarn or fabric after washing and drying. All products made of natural fibers have a tendency to shrink 4% - 8%. Silk – A fiber produced by the silkworm Bombyx mori, also known as the mulberry silkworm, with which the worm weaves its cocoon. One of the finest textiles, silk is soft, has a brilliant sheen, and is very strong and absorbent. A luxurious fabric, silk is lush to the touch and drapes beautifully on the body. It is sensitive to sunlight as well as perspiration and must be carefully laundered. While silk is essentially organic, standards are being developed for organic certification of silk. Spandex – An elastic type fiber that can be stretched many times its length and then spring back to the original length. Spandex is more resistant to washing, perspiration, and heat than latex. Spandex is used in foundation garments and hosiery. Spectra® - An ultra-high-molecular-weight polyethylene fiber made by Allied Signal®. It is the strongest manmade fiber available. Spectra® is 8-10 times stronger than steel, 40% stronger than aramid fiber (i.e. KEVLAR®) and stronger and lighter than virtually every other commercial high-modulus fiber. Spectra® offers almost twice the cut resistance of KEVLAR® of the same weight. Synthetics – Fabrics that are not from natural origins. Synthetics include manmade polyesters and polyvinyl fiber derivatives such as Acrylic, Nylon and Spandex that have been synthesized from petroleum and carbon derivatives. Tactility - The ability to feel and sense touch while wearing gloves. The somatosensory system is a diverse sensory system comprising the receptors and processing centres to produce the sensory modalities such as touch, temperature, proprioception (body position), and nociception (pain). The sensory receptors cover the skin and epithelia, skeletal muscles, bones and joints, internal organs, and the cardiovascular system. While touch is considered one of the five traditional senses, the impression of touch is formed from several modalities; In medicine, the colloquial term touch is usually replaced with somatic senses to better reflect the variety of mechanisms involved. At its simplest, the system works when a sensory neuron is triggered by a specific stimulus such as heat; this neuron passes to an area in the brain uniquely attributed to that area on the body—this allows the processed stimulus to be felt at the correct location. The mapping of the body surfaces in the brain is called a homunculus and is essential in the creation of a body image. Taffeta (formerly sometimes spelled taffety) - A lustrous, medium-weight, crisp, smooth woven fabric made from silk or synthetic fibers. The word is Persian in origin, and means "twisted woven." It is considered to be a "high end" fabric, suitable for use in ball gowns, wedding dresses, and in interiors for curtains or wall-covering. There are two distinct types of silk taffeta: yarn-dyed and piece-dyed. Piece-dyed taffeta is often used in linings and is quite soft. Yarn-dyed taffeta is much stiffer and is often used in evening dresses. While silk taffeta has been classically woven in Italy and France and until the 1950s in Japan, today most silk taffeta is produced in India. Originally this was produced on handlooms, but since the 1990s, it has been produced on the most modern looms in the Bangalore area. From the 1970s until the 1990s, the Jiangsu province of China produced some fine silk taffetas. They were less flexible than the Indian mills that now dominate production. Other countries in Southeast Asia and the Middle East are weaving silk taffeta, but not yet either at the quality or competitiveness of India. The most deluxe taffetas are still woven in France, Italy, and the United Kingdom. Taffeta was also used to make medieval Noble Ladies dresses. On November 4, 1782, taffeta was used by Joseph Montgolfier of France to construct a small, cube-shaped balloon. This was the beginning of many experiments using taffeta balloons by the Montgolfier brothers, and led to the first known human flight in a lighter-than-air craft. The fabric has been known since at least the Renaissance period. William Shakespeare mentions it in Twelfth Night, before the Clown's exit: "Now, the melancholy god protect thee; and the tailor make thy doublet of changeable taffeta, for thy mind is a very opal!" It is also mentioned in Henry IV Part I "Act I: Sc 2", when Prince Hal compares the sun to "a fair hot wench in flame colored taffeta." Tapered Legs - Pant legs that become progressively narrower toward the ankle. Thread Count - The number of yarns per square inch in a woven fabric "warp yarn x weft yarn per sq. inch". The higher the count the finer the fabric. Tri-acetate - A manufactured fiber, which, like acetate, is made by modifying cellulose. Tri-acetate is less absorbent and less sensitive to high temperatures than acetate. It can be hand or machine washed and tumble dried, with relatively good wrinkle recovery. Tricot – A warp knit fabric of silk, rayon, or synthetics in which the fabric is formed by inter-looping adjacent parallel yarns. The warp beam holds thousands of yards of yarns in a parallel arrangement, and these yarns are fed into the knitting area simultaneously. Sufficient yarns to produce the final fabric width and length are on the beam. Knit or warp knitted with vertical wales on surface and more or less crosswise ribs on the back. It has a thin texture, made from very fine or single yarns. Glove silk is a double bar tricot "very run-resistant". Used in underwear, sportswear, bathing suits, gloves. Tricotine – A fabric of worsted, wool, rayon, or blends with synthetics. It has a double twill rib on the face of the cloth with a very clear finish. It drapes well, and tailors easily and is medium in weight. It has exceptional wearing qualities and is very much like cavalry twill, but finer. It is in the same family as whipcords, coverts, and gabardines. Tropical Worsteds - 100% worsted. If it is just called tropical, it can be made up in any fiber or blends of wool and synthetics. It has a plain and open weave. The yarns are tightly twisted and woven to permit a free circulation of air. It is lightweight ad is ideal for summer and tropical wear. It has a clear finish and wears and tailors very well. Turtleneck - A high, close-fitting, turnover collar used especially for sweaters. Tweed – Generally made of wool, but can also be fabricated from cotton, rayon, silk, linen, and synthetics. Tweed is the Scotch name for twill and originated along the banks of the Tweed river, which separates England from Scotland. It is sometimes known as "tweel" and is similar to homespun cheviot and shetland. They are the same in texture, yarn, weight, feel, and use. Tweed was originally only made from different colored stock-dyed fibers, producing various color effects. The tweed fabric family consists of a wide range of rough surfaced, sturdy fabrics. There are also some closely woven, smoother, softer yarn fabrics, and many monotone tweeds. Tweed may also be plaid, checked, striped, or have other patterns. It does not hold a crease very well. Typically used in a wide range of suits, coats, and sportswear for men, women and children. Tweed "Harris Tweed" - All are hand woven on the islands off the northern coast of Scotland "Outer Hebrides". Harris Tweed was originally woven from hand-spun yarn. When damp, it smells mossy and smoky. Twill - A fabric that shows a distinct diagonal wale on the face such as denim, gabardine, or tricotine. It is made by passing the weft threads over one warp thread and then under two or more warp threads, over one and under two or more, and so on, with a "step" or offset between rows that creates the characteristic diagonal pattern. Because of this structure, twills generally drape well. 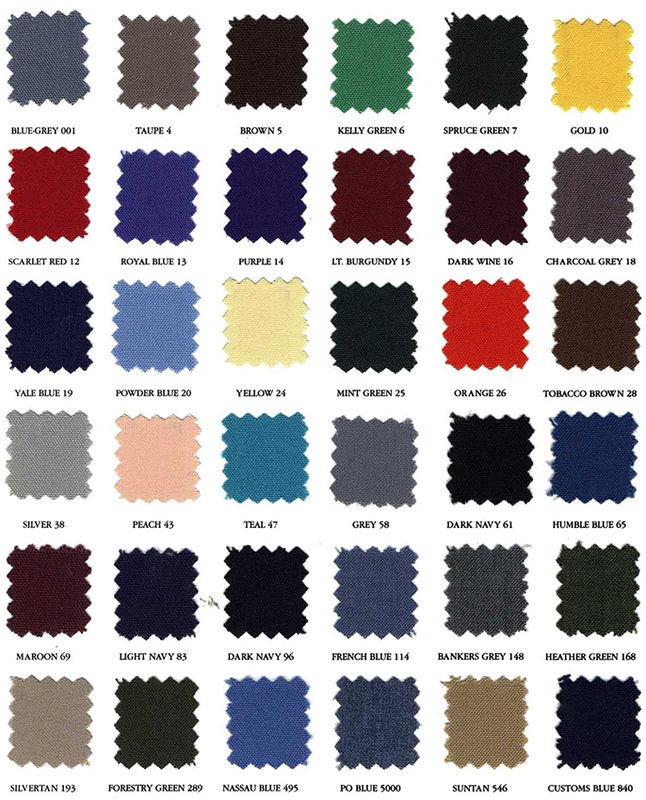 Examples of twill fabric are chino, denim, gabardine, tweed and serge. Twill Weave - A basic weave in which the fabrics are constructed by interlacing warp and filling yarns in a progressive alternation which creates a diagonal effect on the face, or right side, of the fabric. In some twill weave fabrics, the diagonal effect may also be seen clearly on the back side of the fabric. Tyvek "TIE-veck" - A brand of flashspun high-density polyethylene fibers, a synthetic material; the name is a registered trademark of the DuPont® Company. The material is very strong; it is difficult to tear but can easily be cut with scissors or any other sharp object. Water vapor can pass through Tyvek, but not liquid water, so the material lends itself to a variety of applications: medical packaging, envelopes, car covers, air and water intrusion barriers "housewrap" under house siding, labels, wristbands, mycology, and graphics. Tyvek is sometimes erroneously referred to as "Tyvex." V-Neck - V-Back - An open yoke coming to a "V" shape midway down the bodice. Warp Knit - A type of knitted fabric construction in which the yarns are formed into stitches in a lengthwise manner. Warp knits are generally less elastic than weft knits. Common examples of warp knits are tricot knits and raschel knits. Warp Thread - The set of fixed threads that are set lengthwise across the fabrics. Wedding-Band Collar - A collar featuring a yoke that is either open or of sheer net with an ornate band fitting snugly on the neck, creating a choker effect. Weft - The crosswise threads of any woven fabric. Whipcord - Cotton, rayon, worsted or woolen twill that is similar to gabardine, but the yarn is bulkier and much more pronounced. It is very durable, rugged and stands hard usage and wear. In time, it shines a bit with wear. Some times back is napped for warmth. It is named because it stimulates the lash of a whip. Wool – A protein fiber usually associated with fiber or fabric made from the fleece of sheep or lambs. However, the term "wool" can also apply to all animal hair fibers, including the hair of the Cashmere or Angora goat or the specialty hair fibers of the camel, alpaca, llama, or vicuna. Wool is very resilient and resistant to wrinkling. It is renewed by moisture and well known for its warmth. Wool has two qualities that distinguish it from hair or fur: it has scales which overlap like shingles on a roof and it is crimped; in some fleeces the wool fibers have more than 20 bends per inch. It absorbs and releases moisture slowly, which allows excellent insulating capabilities and breathability. It can even hold 30% of its own weight without feeling damp. Wool "Eco Wool" – Sheared from free range roaming sheep that have not been subjected to toxic flea dipping, and have not been treated with chemicals, dyes, or bleaches. Eco wool comes in natural tones of white, grey and black. Worsted Fabric - A tightly woven fabric made by using only long staple, combed wool or wool-blend yarns. The fabric has a hard, smooth surface. Gabardine is an example of a worsted fabric. A common end use is men's tailored suits.